Help us “Share” the love with MoonShare! Bridge Communities is going into the new year with a goal to “share” the love via a MoonShare grant, as we’ve been selected as one of 50 potential organizations poised to receive a $5,000 grant from Sugarlands Distilling Co. Will you help us? 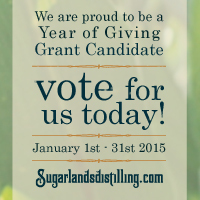 Earlier this fall, Sugarlands Distilling Company launched a nationwide grant-giving campaign aiming to donate over $60k to non-profits and charitable organizations throughout 2015. We need Bridge Communities supporters to help us win the grant by voting for us daily until January 31. Voting is easy: simply click here to access Sugarlands’ Facebook page, “Like” the page, and click on the Bridge Communities logo. You can vote once per day per e-mail address.